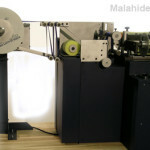 The E2-TR is a fully automatic, multi-colour Ribbon Printing System. 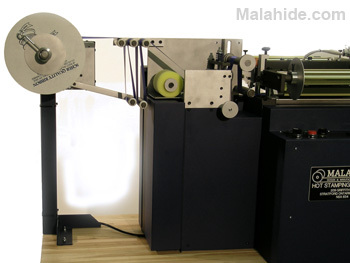 Running at speeds of up to 7,200 impressions per hour, the E2-TR is commonly used to hot stamp award ribbons, gift and packaging ribbon, rosette components and many other styles of narrow web textiles and tapes. 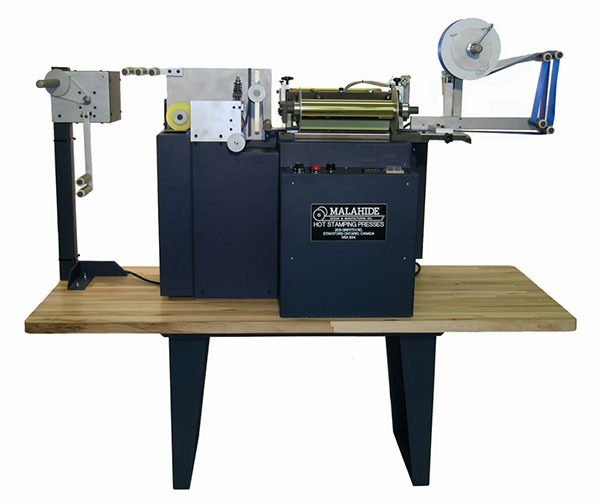 The E2-TR has a 3″ X 10″ impression area, a 1″ ~ 32″ maximum ribbon pull, and a 3″ x 3″ maximum cutting area. 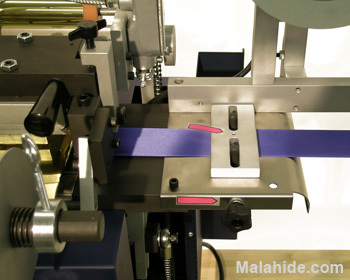 The printing process begins by clamping the ribbon onto the constant tension unwind mechanism. 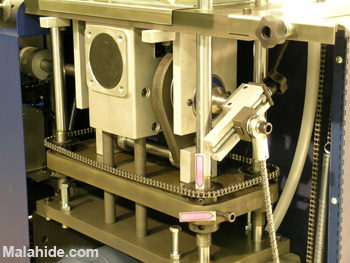 This mechanism keeps the ribbon tight as it passes through the machine (figure 1 ). The ribbon next travels through two adjustable ribbon guides that assist with tracking. The guides are independently positioned by turning the black knobs on the side of the guard (figure 2). The ribbon is stamped when it passes beneath the print head. 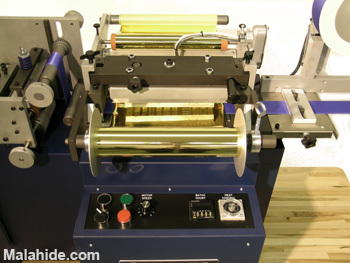 The ribbon pull mechanism then advances the ribbon over the registration roller which registers the print to the cut (figure 3). 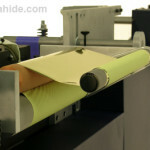 The die cutter cuts the ribbon into pieces from 1 ~ 32″ long or into shapes up to 2.75″ sq. 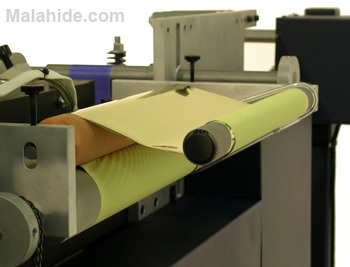 Once cut, the ribbon is discharged from the machine by the foam discharge roller (figure 4). 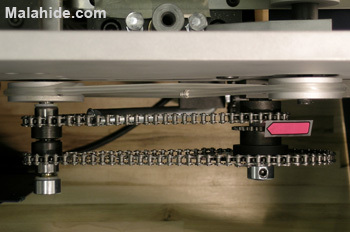 One central CAM mechanism supplies mechanical power to the entire machine (figure 5). Smooth and precise, all bearings and parts are purposefully over-sized to ensure long life and durability. 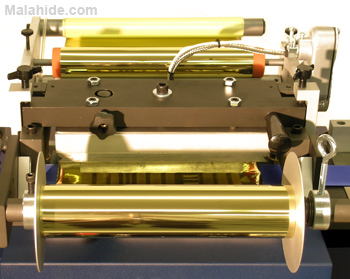 The E2-TR generates up to 5 tons of pressure, more than sufficient power to produce dazzling foil stamped ribbons. An all-electric machine, the E2-TR uses an electric motor as its power source, not pneumatics like most other hot stamping machines. This means that with the E2-TR, you don’t need a high-end air compressor, plus you eliminate 100% of the many inherent issues of pneumatic equipment. Furthermore, the E2-TR runs cleanly and quietly, making it suitable for use in a home or office setting. The CAM mechanism powers the print head, pulling it down from all four corners (figure 6). 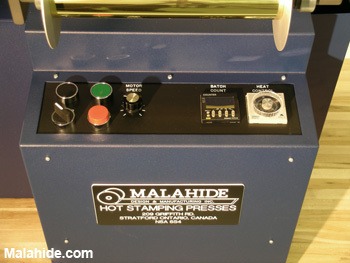 This results in an even dispersion of pressure across the 3″ x 10″ print area. 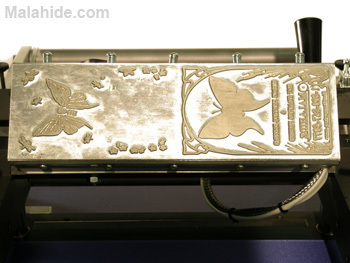 A central heater runs the full length of the head to ensure even heating. 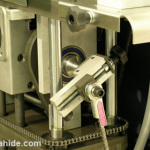 Four levelling screws on the top of the head allow for fine adjustment. A central pivot allows one to rotate the head 5 degrees each way for fine alignment. All of these attributes are elements of a flip-over chase whichflips up for easy access to the die area (figure 7). The E2-TR is delivered with your choice of 2 chases. All electronic components are brand-name (mostly Omron) and solid state (figure 9). 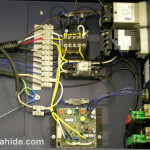 A modular control box design allows for quick repair in the unlikely event of a component problem. 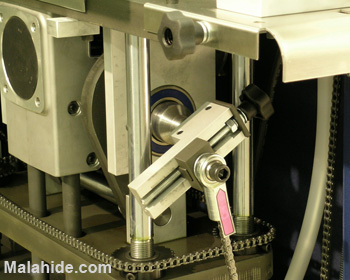 The length of the ribbon advance is adjusted by means of a crank located within a door on the left side of the machine (figure 11). 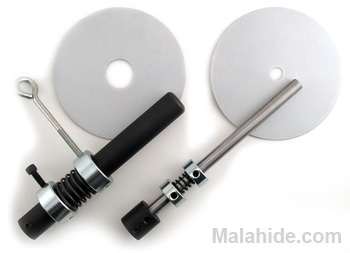 One simply unlocks the center nut, and then turns the black knob to adjust the ribbon pull from 1″ ~ 32″. 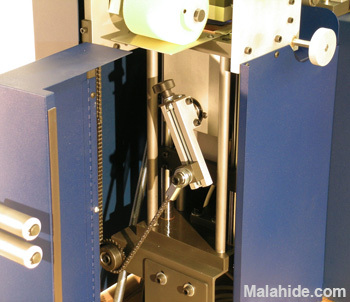 An identical mechanism within the right door of the machine adjusts the length of the foil pull from 0.75″ ~ 3″. 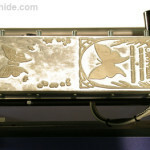 Impressions can be run as closely as 1/8″ from one another for foil economy (figure 12). Running from front-to-back, the E2-TR features a 10″ wide, single or multicolour foil feed. 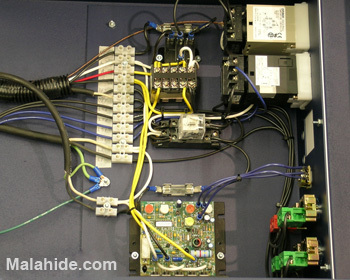 The foil is clamped on the unwind bar above the control panel (figure 13). 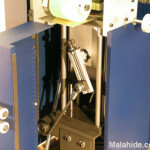 The foil feeds into the machine, beneath the print head, and towards the rear where it is threaded through the drive system and rewound (figure 14). 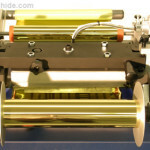 Foils as thin as 1″ feed well, and multiple rolls of different colored foils can be fed simultaneously. 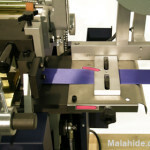 This means that the E2-TR is able to stamp the ribbon with multiple colors of foil, in one pass. Multi-color ribbons are perceived to have a higher value than conventional, single color ribbons. Despite this perception, the truth is that multi-color prints can be produced for about the same cost. Whether converted into higher margins, or used as a competitive advantage in a tight marketplace, multi-color printing is a customer pleasing, profit generating sales tool. 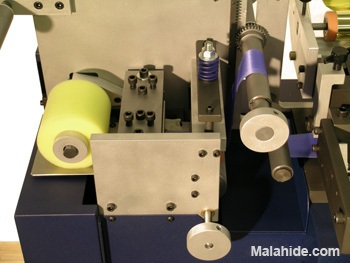 Customers who wish to hot stamp continuous printed ribbon, narrow webs or uncut tapes should equip the E2-TR with the optional rewinder (figure 15). 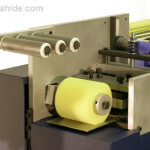 Enabling the E2-TR to re-roll printed ribbon onto a spool, the rewind self-adjusts to the speed of the press. In the middle of every roll of ribbon is a hole or “core”. 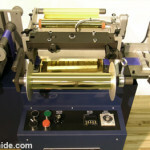 When mounting the ribbon roll on the machine for printing, a spindle (figure 16) passes through the core to support the roll. 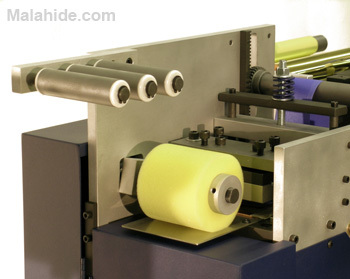 Since many of our clients source their ribbon from different suppliers, it is common to have several core sizes in stock, and in turn several corresponding spindle sizes. 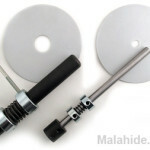 Common sizes are : 3/8″ , 1/2″ , 5/8″, 1″, 3″, 39mm. Spindles are easily changed by unlocking a single bolt, sliding the spindle off its’ hub, and then replacing it with the correctly sized spindle. The base version of the E2 runs at 3,600 ribbons per hour. This is a very comfortable speed for the machine, and you can expect to run flat out on most applications. The base version is well suited to smaller ribbon companies, rosette specialists, wedding ribbon suppliers, and mid-volume specialty-gift companies. The speed upgrade doubles the E2-TR’s top speed to 7,200 impressions per hour. This additional production capacity is well-suited to volume producers of continuous ribbons as well as award ribbon companies with volumes of medium to long runs. 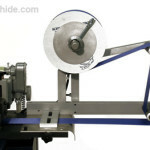 The base E2-TR comes equipped with a 1″ ~ 12″ ribbon pull. 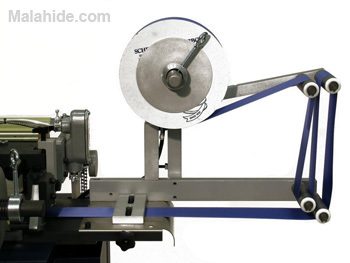 The 32″ upgrade (figure 17) increases the ribbon pull to 1 ~ 32″ of ribbon. This is a popular option for gift basket companies and companies who produce neck ribbons and rosette streamers. 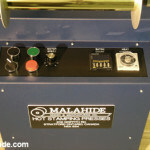 Malahide Specifications & Pricing for E2-TR: Malahide by Spartanics E2-TR.